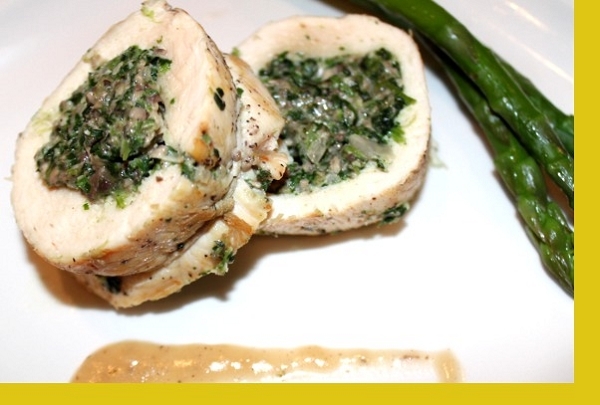 This tasty chicken dish takes chicken breasts and fills them with a delicious spinach and mushroom stuffing. Served with a light butter wine sauce this dish is gourmet dining at its finest. Served with a side of vegetables. Preheat oven to 400°F. Place the pan of chicken in the oven and bake for 25 to 30 minutes. Remove from the oven, place on cutting board and slice at an angle about half inch in thickness. Microwave sauce until warm and drizzle on chicken before serving with a side of vegetables. Can't wait till it's on the menu again. Very good entre. My husband and I found it to be delicious and plenty of food for two. We thoroughly enjoyed it and the vegetables are perfect with it. Thank you you for another great meal! This was enjoyable. A very generous serving also. 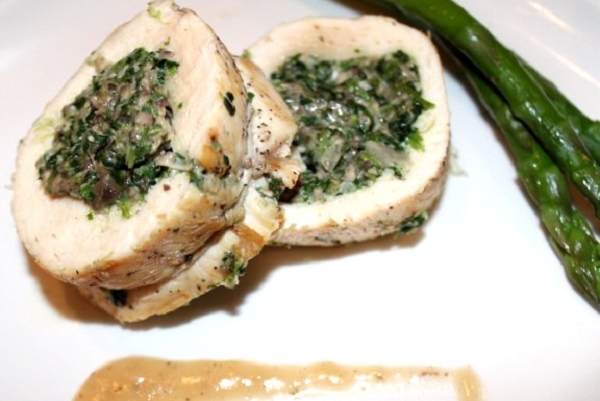 Tasty way to use chicken breast. Maria is amazing at chicken dishes (and everything lol). Her stuffed chicken dishes are my favorite. So easy to pop in the oven, and healthy! This was amazing. The sauce is put over the chicken takes everything to a whole other level. I love the veggies and always crave them if they aren't in the rotation. Delicious! Another delicious meal and so easy to prepare that my husband had it ready by the time I got home from work. Vegetables were good as was the stuffed chicken!!!! This is one would be perfect for guests to impress although it was just the two of us! The food is excellent and generous proportions...made for a great lunch at the office the next day. Delicious and unusual menu. We have never eaten chicken this tasty before. Maria's Gourmet Kitchen is very generous with its portions. So, my husband and I have eaten this meal as dinner,and have used the left over in two equally tasty sandwitches the next day!